Medway is a conurbation and a unitary authority which covers 74.41 square miles of land in northern Kent where the River Medway empties into the Thames Estuary. It is an area of rich historic heritage and includes the main towns of Strood, Rochester, Chatham, Gillingham and Rainham. The area also includes parts of the North Kent Marshes which are some of the most important natural wetlands in northern Europe. It is said that 300,000 migrant birds use these areas as a safe haven on their migratory journeys between the Arctic and Africa. Rochester was established on an Iron Age site by the Romans to control the point where Watling Street crossed the River Medway. It is well-known for its Norman Castle (constructed 1087-1089) and Rochester Cathedral which is the second oldest in Britain (constructed 1079-1238). Chatham is home to the Chatham Historic Dockyard which for 414 years provided the Royal Navy with ships. Over 500 were built here including Nelson's flagship, the HMS Victory. The dockyard was originally protected from enemy attack (unsuccessfully) from the opposite bank of the Medway by Upnor Castle. Following a successful raid on the docks by the Dutch in 1667, the defences were upgraded which lead to the a number of forts created. A certain set of these, created between 1870 - 1892, became known as the 'Great Lines'. This links in quite nicely with the theme of this post as the Great Lines Heritage Park, in Gillingham, is now home to Medway's first parkrun - Great Lines parkrun (blog7t links: Great Lines parkrun event 1 / Great Lines parkrun xmas special / course video). 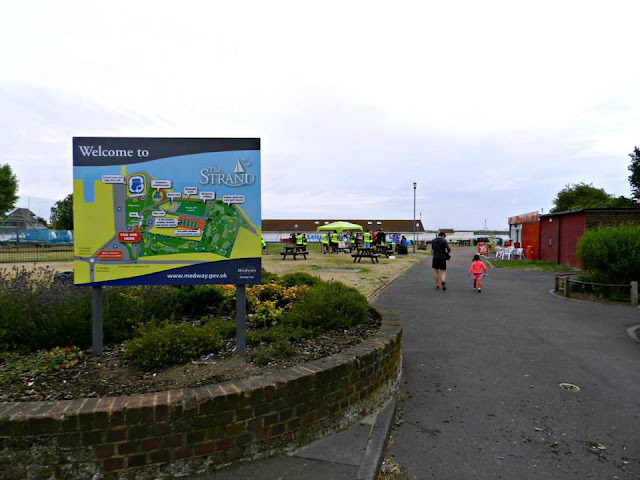 If you travel about a mile (as the crow flies) to the north east of the Great Lines Heritage Park, you will arrive at an area on the bank of the Medway Estuary called 'The Strand'. This area was acquired in 1892 and a pool opened here in 1896. Further development between 1921 - 1926 transformed the area into a riverside pleasure ground. The area has been developed further and these days consists of an open-air swimming pool, 300 metre lazy river, water zorbing, boating lake, 9 hole golf course, crazy golf, four tennis courts, footgolf, two children's playgrounds, a court for net/foot/basketball, picnic area and café, a historic miniature railway and, as of 12 July 2015, a junior parkrun! 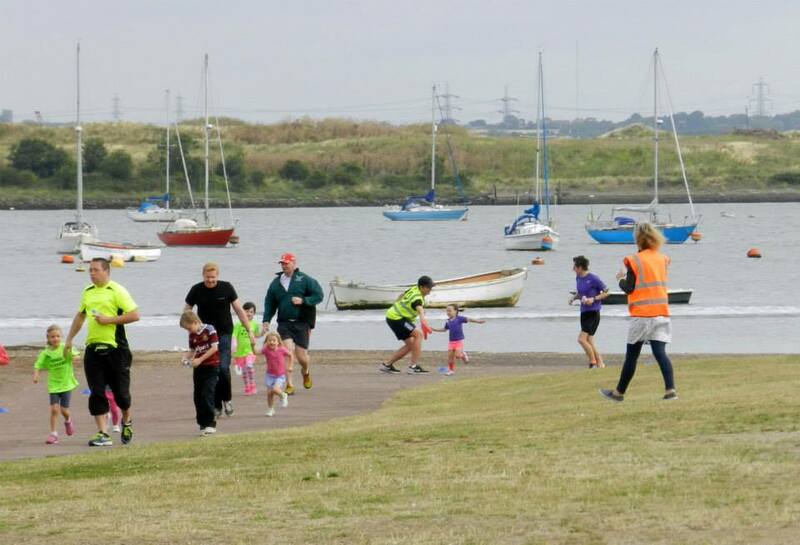 Medway junior parkrun is included within Medway's ParkSport programme which has been set up to bring various sporting activities to the area. A quick look at the calendar reveals weekly sessions including archery, netball, tennis, and others. Some of these activities require a fee to be paid. 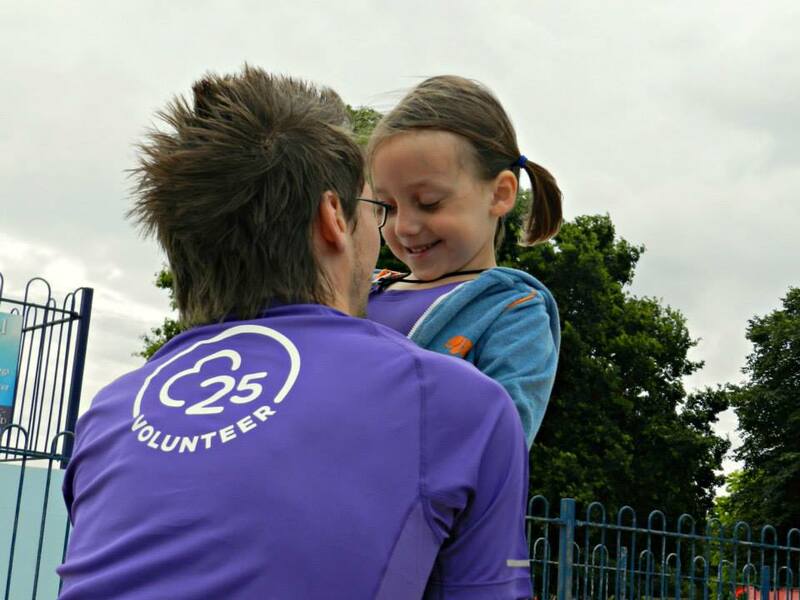 The junior parkrun is open to 4-14 year olds and is, of course, completely free. 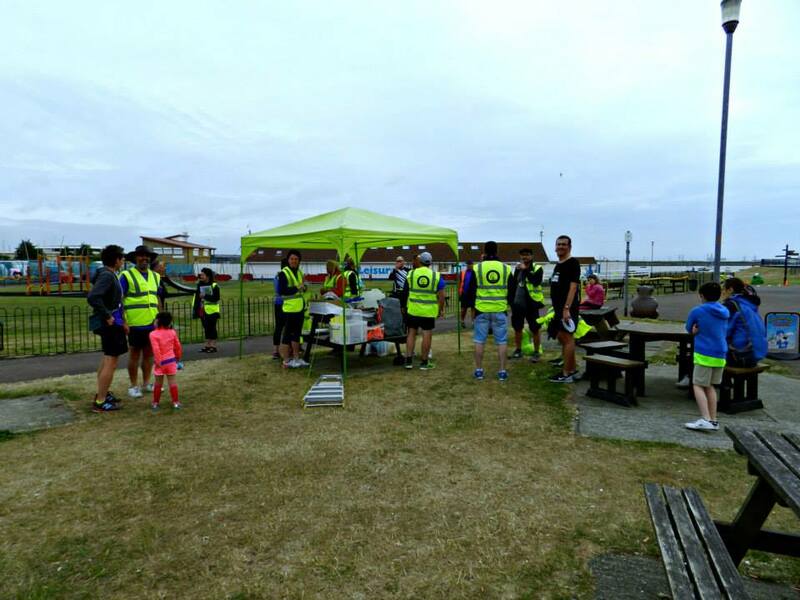 For anyone attending the junior parkrun, it takes place on The Strand, Gillingham and starts at 9.30am every Sunday (remember, junior parkrun start times and frequency do vary between venues). Car parking is available in The Strand car park and is completely free of charge. Anyone wishing to travel by train can alight at Gillingham train station and complete the rest of the journey with an approx. 20 minute walk. Sadly the area is not served by buses early on a Sunday morning. As I mentioned above, there is a café - it is right next to the start-finish area and is planned to be used as the post-run social meeting place. The toilets are just next door, they are a little tired and have clearly been the victim of some vandalism but they do the job. 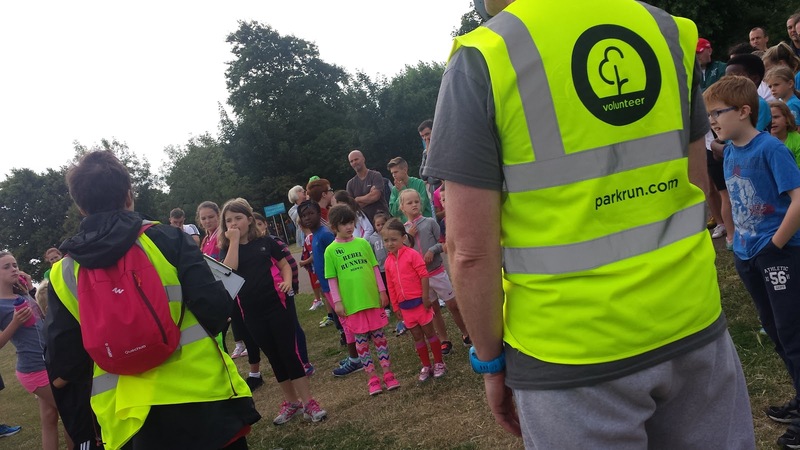 All junior parkruns start the same way and that is with a run briefing. Being the inaugural event, the briefing was a little long but I'm sure the event team will try to streamline it in future so the kids can get on with the real business of the day, which of course starts with the legendary junior parkrun warm-up session. 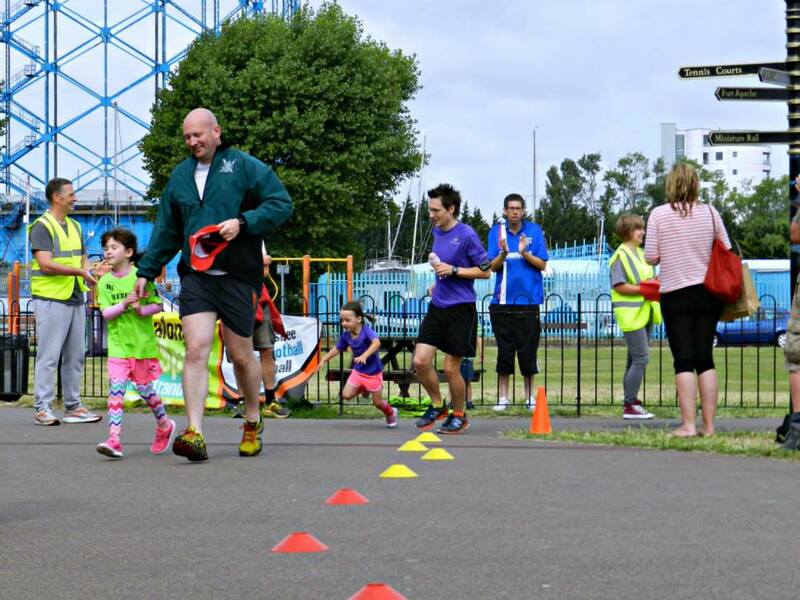 The junior parkrun warm-up is a scripted affair so you should find it is virtually identical at each and every junior parkrun venue. It all seemed to go to plan at the inaugural and Matilda reports that she enjoyed it. 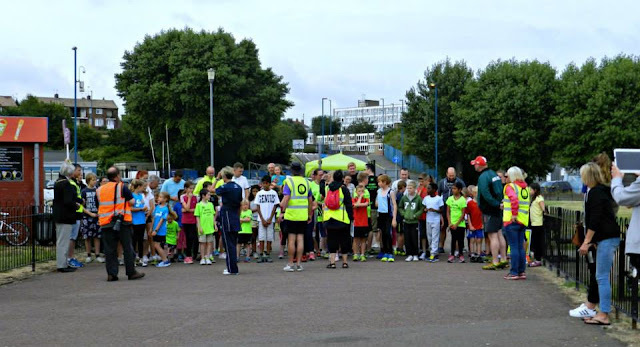 Once this was done, the junior runners were ushered over to the start line where the run was officially started by the Deputy Mayor of Medway. It's worth pointing out that at present (July 2015) the course description and the course map do not completely match up with the actual course, but I'm sure that will be updated fairly soon. The course is 100% tarmac paths - mostly smooth, but occasionally a little gravelly. The first part is a small anti-clockwise loop around the children's paddling pool where Matilda was hi-fiving the marshals. Unfortunately this is as far as she got as she fell over at the end of this loop and in the process grazed her knees and elbow (her junior parkrun incident form tourism has now reached three venues). We were well looked after by the volunteers and Matilda was soon patched up with a few different styles of Peppa Pig plasters and given a lollipop. Thank you! 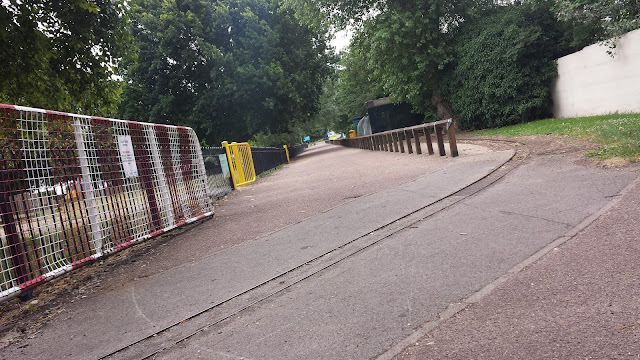 The rest of the course involves running three larger anti-clockwise laps which follow the route of the miniature railway (crossing the track on several occasions - don't worry, the train wasn't running) past the tennis courts and crazy golf, before looping around and coming back along the riverside path where the smaller loop around the paddling pool forms the end of the large lap. I was really pleased to see loads (and I mean loads) of junior Rebel Runners out there taking part and there seemed to be just as many supporting the event by volunteering. In fact, there were an unusually high number of running club members here with 33 (46%) of the 71 runners listed as belonging to a club. At the end of the third large lap, the runners peel off of the loop, and run back towards the start line, which is now the finish line, collect their token and pay a visit to the barcode scanner. After that it's a choice of heading off home, hanging around for the post-run social or maybe enjoying some of the activities on offer. We popped over to the paddling pool for a bit, but it was a little windy and overcast so we soon jumped back in the car and headed off in the direction of a pub for some Sunday lunch. Sadly it was another DNF for Matilda, but the seventy-one runners that did finish set a new attendance record for a junior parkrun in Kent. Not bad at all.